The list of team building ideas is endless but these should be carefully selected to avoid a collective groan and eye-rolling from staff members. The idea of team building is to combine fun with a pre-set list of goals such as inspiring confidence, teaching better communication skills and combining the work force into a unified and collaborative team. Here are a few ideas that can achieve those objectives and instil a sense of humour among employees. The objective of this game is to escape before a team member is eaten by a starving zombie. Objects needed are a rope, key and a set of clues. A team is “locked” into an empty space while one of the members is elected as the zombie. The zombie is tied with the rope in a corner of the room and the rope is extended every five minutes until the zombie is able to reach the team members. The team needs to solve a series of clues that will allow the key to “unlock the door” enabling their escape before being eaten by the hungry zombie. This is a creative, problem-solving and collaborative exercise. Team members are given a list of 20 trivia questions related to their working environment. This could include questions such as “what colour are the bathroom tiles”? “how many people work in the accounts department”? or “what brand of computer monitors do we use”? This is a quick and fun-filled team bonding exercise. Tape one of a pairing of well-known phrases such as “salt and pepper” and “peanut butter and syrup” onto the back of each participant. Participants then mingle and try to establish the word pinned to their backs by asking each other only “yes” and “no” questions. Once they have figured out the word on their back they must find the other half of their pairing. Once they find each other they must establish three things they have in common. This is an exercise in communication skills. Defining a company coat of arms is a great team bonding exercise. Armed with paper, pens and markers, team players divide their pieces of paper into three sections. In the first section, they must draw something that displays a recent achievement. In the second section, they must draw something reflecting company values. Thirdly, they must draw something that represents a vision for the company’s future. Completed coat of arms should be displayed in their work spaces. The plane crash exercise is to stimulate creative problem-solving and collaborative skills. Teams must imagine that a plane on which they are travelling crashes onto a desert island. Groups must scour the office for 12 items they feel will be most useful in order for them to survive. Each of these 12 items must be ranked in order of importance. Team building is a proven method of increasing productivity, success and efficacy and should be a high priority exercise in the workplace. Team building exercises are a proven method to turn any discordant group into a smooth and well oiled operating machine. All offices are filled with people who have different skills and responsibilities and whose personalities can result in conflict. Team building exercises can change that group of co-workers into a cohesive, productive and happy team. There are a number of exercises that can be implemented. Asking employees to write down their expectations will help overcome personality clashes. Their expectations, written anonymously on a blank card, are then listed on a board and each item is discussed by the team. The expectation exercise allows employees to focus on ideas, rather than the person responsible for the suggestion. This makes for enthusiastic and fruitful discussion. This is an exercise in which teams compete to build the tallest free-standing tower in 18 minutes with just 20 pieces of spaghetti, one marshmallow, one meter of string and one meter of tape. Who was the group leader? Could the task have been completed without a leader? How helpful were team members? How well received were ideas given by team members? Did the time limit have any impact on the team? What could the team have done differently? This exercise helps teams to get to know one another better and helps to build collaboration. Random questions should be written on a beach ball and range from topics such as “what are your monthly/weekly goals”? to “what is your favourite food”? The team stands in a circle and tosses the ball around. The catcher must answer the questions closest to his/her index finger. The egg drop is a classic collaboration and problem-solving exercise. This exercise takes about two hours. Teams are divided into two or three groups and, with tools and materials provided must construct an egg package that will survive a 2.5-metre drop. Once the packages have been completed, each team creates a 30-second ad describing the materials used for the project. Then the teams drop their egg packages and success rates are gauged. The egg drop is a fun exercise and teaches people that working together can increase innovation and creativity. The ads they create are an example of collaboration, while the egg drop is a competitive and exciting challenge. Although this is not a game, adopting a charitable cause can unite co-workers. Companies can allocate two or three work days each year to allow employees the time to donate to a charity. Co-workers are encouraged to work in teams and can donate their time to any number of causes such as a helping hand at homeless shelters, sharing mentoring skills at schools, or even helping to build homes for the needy. These are just some of the team building exercises that can be used to turn a disgruntled and unhappy group of co-workers into a happy and cohesive work force. 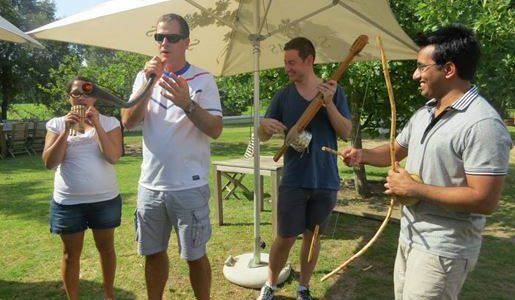 The objective of team building is multi-faceted, however all exercises should be both educational and enjoyable. This will build team spirit and teach employees about how their fellow workers think, work and solve problems. This game takes five to six minutes and can be implemented for one person or a number of small groups. A team member in each group is handed an object. After examining the object, the other members of the group must individually “describe” the object without speaking. The object of the game is to inspire innovation and creativity. Another five to six minute exercise, winner/loser is played in groups of two people. One team member describes something negative about their life. This must be true and can be a work-related or personal memory. His/her partner then discusses the same subject, focussing on only positive aspects. Afterwards they switch roles. The objective of winner/loser is how to change a negative situation into one with a silver lining. Truth and lies is a 10 to 15 minute exercise for five or more people. Participants sit in a circle and each one, in turn, relates three facts and one lie about themselves. The other team members must try to identify the lie. Truth and lies is an ice-breaking exercise which helps colleagues to avoid making snap decisions about co-workers and encourages introverts to share information about themself. Blind drawing is another 10 to 15 minute exercise for two or more people. Participants are provided with a picture, a pen and paper and are divided into groups of two. Sitting back-to-back, one person is given a picture and the other the pen and paper. The team player with the picture must describe what they are looking at without actually revealing the identity of the subject. The object of blind drawing is to focus on communication and interpretation. This is better than that is a 15 to 20 minute exercise for any number of participants. Participants must select four or more objects and solve a given subject with the objects of their choice. Examples could include scenarios such as “you are stranded on a desert island” or “how would you save the world from Godzilla”? Objects selected for the exercise should be somewhat obscure to inspire problem solving and creativity. This is a one-hour fun-filled exercise for two or more small groups. Armed with a list of wacky tasks, teams must meet a deadline. Whichever team completes its tasks the quickest is declared the winner. The list can include any task, but should be fun-filled such as asking them to take a “selfie” with a complete stranger, or to take a photograph of something obscure inside the building. This is a teambuilding exercise that helps to break up cliques by encouraging employees to work with their colleagues. 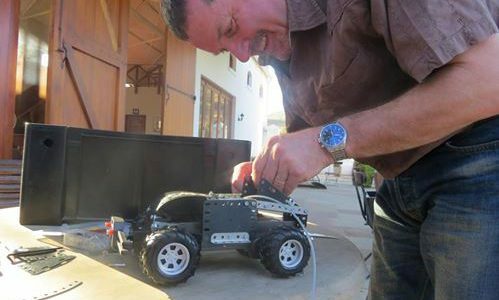 Team building is a fantastic way to stimulate camaraderie and focus on company identity. 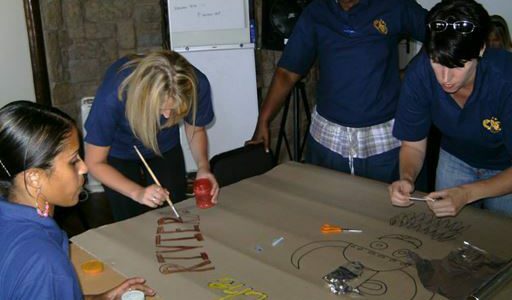 Team building activities improve communication, strengthen morale and act as a catalyst for motivation and productivity. Employees learn to work together as a united and cohesive force. Companies should embrace team building activities as an integral part of corporate culture and as an ongoing project to keep the work force productive and motivated. Embrace team building activities as an important, ongoing part of corporate culture, and understand how and when to use team building exercises. Team building can turn a group of employees into one cohesive team. They will become an organised entity, dedicated to meeting the needs of customers by working together as a co-operative and inter-dependent group. There are many team building activities that can be implemented and here we take a look at just three examples, for any size group, which can effectively change an unhappy workforce into a productive team. Groups are divided into small teams and are given one hour in which to complete a number of tasks, puzzles and riddles to test their skills at problem-solving. Teams begin the exercise in a “locked office” and are all accessories to a heist. They must work together to “escape” by completing the interactive challenges. The escape room challenge achieves a number of goals. • It’s an ice-breaker, helping groups to relax and bond and to get them talking. • It’s an exercise that can be held in any location – indoors or outdoors. • It can be held for small groups as well as very large gatherings. • It is an escape from the tedium of too many conference presentations and gives employees the opportunity to exercise their brains. 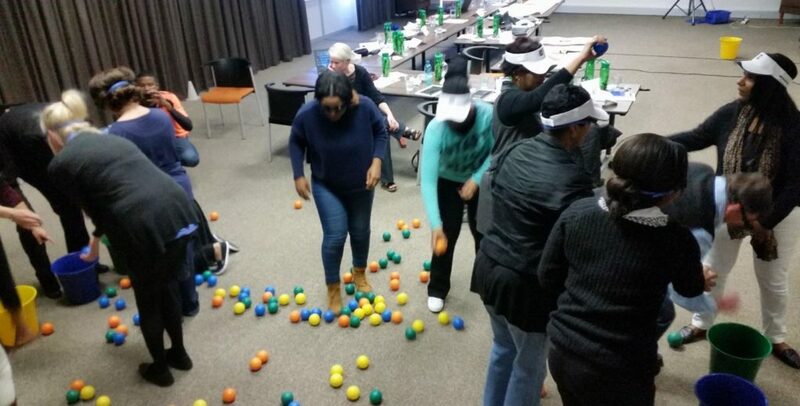 Breaking barriers is another team building exercise suitable for any size group. Each team member is supplied with a board and crayon. The board represents the barrier they need to break. Setting aside two hours, participants write down a barrier on the board. This can include obstacles such as fear of rejection and failure, procrastination, anger and trust issues. On the other side of the board, they write down what they will achieve in their lives once they have broken the barrier. • Self-awareness of personal barriers. • Motivation to overcome barriers. • Increased confidence in the ability to achieve goals. • Adopting a more positive attitude. Suitable for groups of 25 to 400 people, this is a fun-filled team activity that brings people together with one goal in common – to build a bridge. Supplied with duct tape and cardboard, teams are given three to four hours in which to construct a bridge strong enough to hold the weight of an object around 280 kilograms. This could be a golf cart.